Our American Story is inspired by the foundational events that occurred in Virginia in 1619. These events reflect stories of triumph, injustice, struggles, innovation, and success, and they indelibly influenced and continue to shape today’s America. “Our American Story” is a digital student contest (for 8th–12th grades) designed to foster creativity, cooperative learning, critical examination, and discussion among our country’s next generation of leaders. 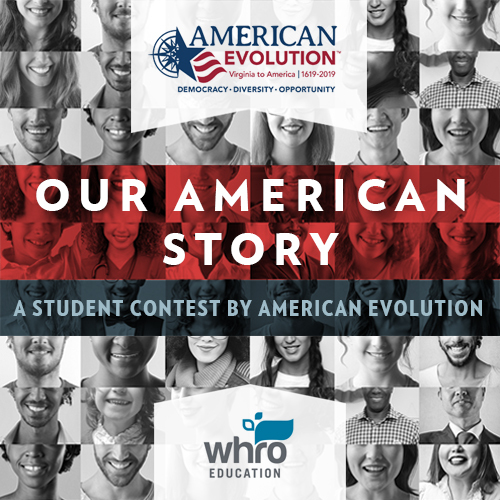 We want to hear students’ unique perspectives on the themes of democracy, diversity, and opportunity. In the process, we hope they will gain a clearer vision of what America can be in the ages to come. For contest information visit here.